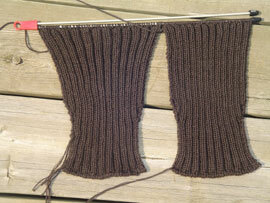 This is were I’m at with the sleeves to my celtic ribbed sweater – not as far as I’d hoped. 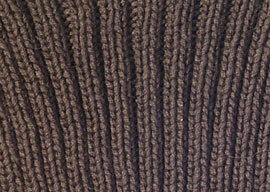 They look really narrow, but it’s only because of the ribbing, plus they are supposed to be pretty fitted. They fit around my arm just fine – although I have thin wrists so the 7 inches for the cuff would probably be a bit snug for some people. I just love the way this cotton is knitting up. I bought this cotton at Camilla Valley Farms in Orangeville, Ontario. I haven’t ever been there in person yet, but I hope to make a trip there with my mom this Fall. I love, love, love their cotton. Did I mention that before? Anyway I may try picking up weaving again. My mom has a small floor loom and said I could have it. Just to find a place for it. Is anyone else getting excited by the fact that Fall is coming? It’s my favorite time of year, I love the holidays of Thanksgiving and Halloween. The crisp air, cool evenings, beautiful colours and the smells of the whole season. I used to dread the Winter that followed, but I’m starting to appreicate the frozen season. Just wanted to say that Fall is my favorite time of year. The air is crisp and cool in the mornings, and I so look forward to Halloween with the kids picking out their costumes, and baking for Thanksgiving. I’m already knitting gifts for Christmas. Hats, scarves, bags, blankets and sweaters. I also want to add that the needle case from your Mom is beautiful! I wish I had some of my Christmas gifts started, because I have so many things I want to make for people. I had almost everything made for Christmas gifts last year at this time, but I’ve been too busy this year. I can’t say what I want to make this year because my family reads my blog, but I’m thinking of some non-knitted gifts that I could make over a weekend. I’ll post them after Christmas – of course.